Guillotine® EC17 Electric Stack Paper Cutter. This high quality electric paper cutter will cut a Stack of 20lb paper up to 1.6" or 400 sheets. 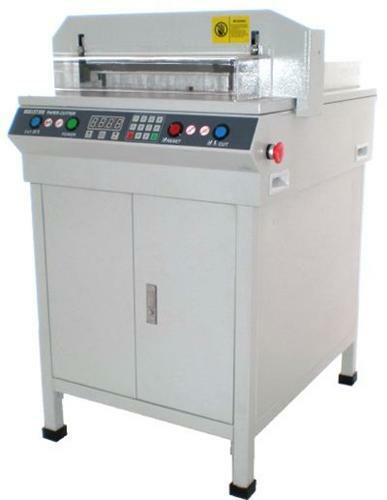 It has a 17.7 inch cut width and length, plus it comes with multiple safety features which include: Front safety shield (with interlock switch that disables the cutter when safety shield is raised), rear safety cover, emergency stop, two cut buttons (requires both hands to push buttons for machine to cut) and breaker switch. The Guillotine® EC17 Electric Paper Cutter is ideal for Schools, Churches, small and large Businesses, Print Shops and much more. Front safety shield with interlock switch to prevent operation unless shield is down. Digital display in inches or millimeters. This cutter is awesome. Well worth the money and what a time saver. The multiple safety features are a big plus. I really like the front safety shield. The blade will not come down unless the shield is down ... and when it is down you cant get your hands near the razor sharp blade. Just wish they had this cutter in black.